This recipe looks great and is quite simple to put together too! Hi Kay! Not only is it simple, it is quick and nutritious!! We had it with tomato soup and toasted wheat bread. Manisha, the co-op sounds like a really neat idea! I wish I had some people I could do that with, but the two hurdles are lack of people and lack of cooking skills on my part. But I'm going to try your veggie bake this week. Thanks! Hey Fran! Good to see you here!! There's never a dearth of people - believe me! Colleagues, neighbors, friends, students, friend from the bus-stop...seed the idea and see where it goes. You never know who might be interested. As for lack of cooking skills, you're kidding me totally on that one, I know! 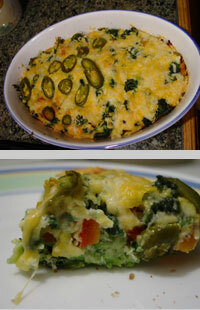 I hope you like the veggie egg bake! I really like this recipe. This looks like a variation of the strata (Itatian). The strata recipe tops the dish off with cheese, and mostly consists of meat etc. This one very nutritious and hassle free. You can go crazy trying all different combinations of vegetables. Thanks! You're most welcome, Garam Masala! It's quite like a veggie quiche, too, as I discovered this weekend. My daughter and I were invited to a friend's place for dinner and we were served vegetarian quiche - it was very similar except that it had a crust and there was cheese mixed into the egg as well as a layer of cheese. It was richer than my recipe. If you have a recipe for strata, please let me know cos I'd love to try it out!! I am Kartik Kannan at Sulekha.com (www.Sulekha.com) and I'm writing to you about your blog. Before I proceed, let me apologise for this unsolicited comment in your blog. I googled for good Indian blogs and found yours. Ok, now to why am I writing to you? I'm compiling a list of the best writings in Indian blogosphere and showcasing them on Sulekha.com. Sulekha (means 'good writing') has been encouraging good writers and showcasing great writing for well over 6 years. Hi Kartik! Thank you very much for the invitation. You are welcome to showcase my blog on sulekha.com as long as my copyright is upheld and you link back to my blog as the original source. I would like to make it clear that I do not wish to create a parallel blog or duplicate my posts on sulekha.com at this time. Thanks again! 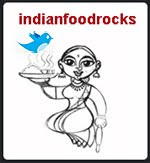 Manisha, how is the dinner coop coming? I love my coop in Boise Idaho and am trying to catalog all the cities that have active dinner coops in the US. It seems one of the problems people have is figuring out how to find suitable members. I will definitely pass your site on to my other members so they will cook some delish Indian food for me! Diana, our cooking coop is more on an ad-hoc basis now. When someone cooks, they call the others to see who might want it and then send boxes out to them. We don't keep track of who gave more or got more. In summer, it as good as shuts down for several reasons: people are on vacation, the other women in our coop are teachers and are therefore not hard-pressed for time on weekdays, and out here in Colorado, it's just too hot to cook large quantities. Finding suitable members is always an issue. I have seen it work with smaller groups especially, with families who have tight schedules on weekdays but prefer to eat home-cooked food than store-bought frozen dinners. It is healthier and cheaper, too! It helps to have a block party or a community picnic or a potluck where people can meet, connect with each other, and maybe even taste each other's food and then sign up in groups of 3-4 families per group. It also works better in a neighbor-to-neighbor environment rather than spread over several neighborhoods as it is easier to meet and exchange food when folks live close by. I wish you all the best with your compilation! You may also want to look into the Time Banking movement and how that has helped with similar neighbor-to-neighbor activities. 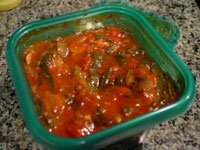 Hi, what changes do I make if I'm using non-frozen (fresh) broccoli?